Hundreds of flights were grounded in Spain as workers of air giant Iberia began a five-day strike in the biggest walkout in company’s history. 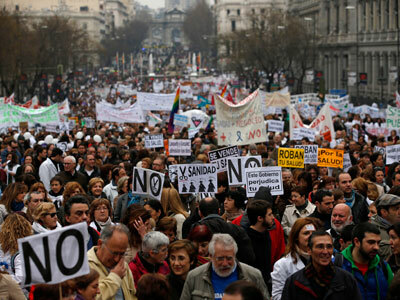 The strike is estimated to cost the Spanish economy 10 million euros a day, the Transport Ministry said. ­Iberia is canceling 415 flights over the next 5 days – 39 percent of its regular domestic and international traffic. Some 800 more flights by other airlines will also have to be grounded. Up to 70,000 passengers were reportedly affected by the first strike alone. Iberia has attempted to minimize the damage by scheduling their customers for different flights, including those of different airlines, and by offering refunds or alternative travel dates. 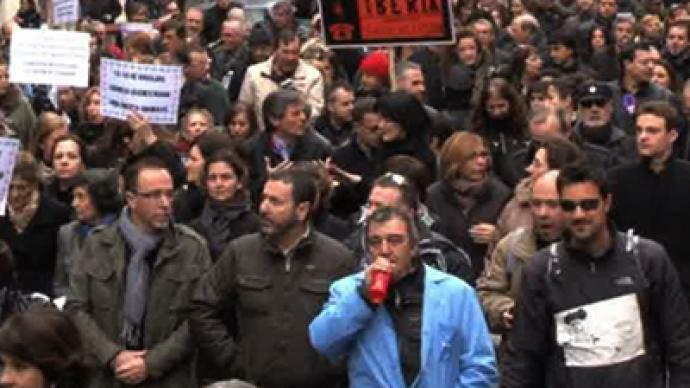 It's the first of three such five-day strikes planned by Spanish trade unions for February and March. 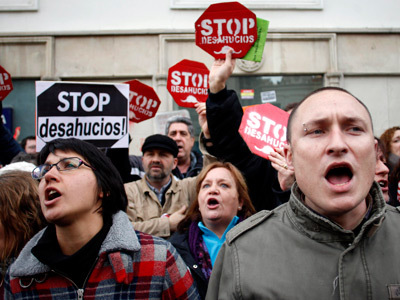 The Iberia strike opened with an 8-kilometer march around Madrid's Barajas Airport on Monday. 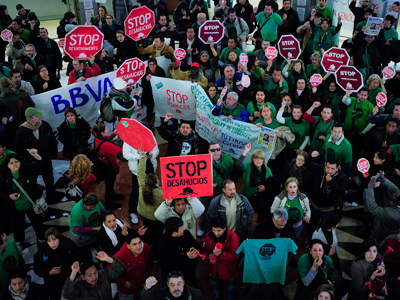 Then despite a blockade set up by Spanish police, hundreds of striking workers were able to get in Terminal 4 of the Madrid's Barajas Airport, which is Iberia’s main operating site at the airport. Protesters carried banners saying "They have sold us to pirates", chanted and whistled while trying to block off access roads and check-in counters. Police pushed back by beating the demonstrators with batons and forcefully throwing some outside the terminal, where an additional 2,000 people were protesting. At least five people were arrested during the incident. However, no significant damage was reported. 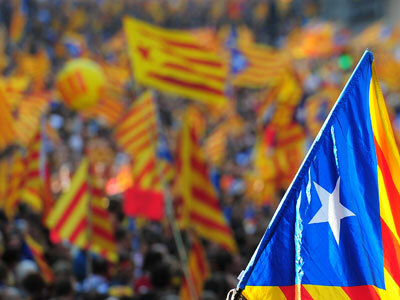 More demonstrations took place in other airports across the country, including Barcelona. 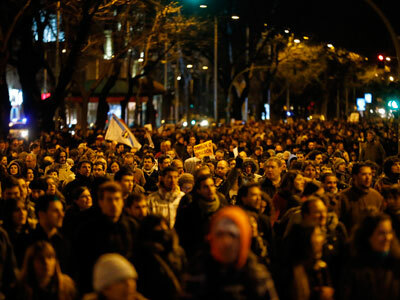 Additional protests are also planned during the week, including a street protest in central Madrid on Wednesday evening. ­Some 20,000 of Iberia’s staff, including baggage handlers and flight attendants, are protesting the management's plan to cut nearly 4,000 jobs and slash salaries for remaining employees. "Nobody is safe from being sacked," Elias Gonzalez, a maintenance supervisor at the protest who has worked for Iberia for 27 years, told Reuters. Much of that anger has been directed against the UK, as Iberia merged with British Airways in January of 2011. The merged company – the International Airlines Group – reported a 262-million-euro ($349.78 million) loss in the first nine months of 2012. An image grab taken from a ruptly.tv video. ­The current strike coincides with school holidays in Britain, Spain's biggest source of tourism, causing the country’s already-troubled economy to lose an estimated 10 million euro every day. Transport Minister Ana Pastor pleaded last week for the airline and labor unions to strike a deal, arguing Spain cannot afford such losses. Two further strikes are planned for March 4 through 8 and March 18 through 22. Financial analysts estimate Iberia losses for all 15 days to be between 50 million euros and 100 million euro. Virtually no passengers are stranded at Spain’s airports, thanks to the skeleton service the government obliged trade unions to provide under Spanish strike laws.